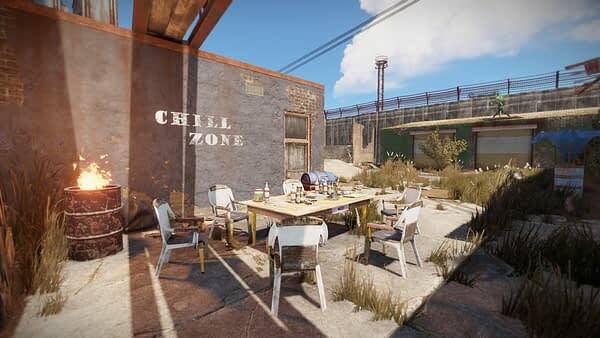 Facepunch Studios released a brand new update for Rust this weekend, simply called “The Compound” which has added a few new mechanics to the game that is set to both improve what you can do and expand on ways to make people suffer. The biggest addition to the game is an area called The Compound in which several items are banned and you are able to converse and maybe do business with a couple of people through trades. If you break the rules, the game will punish you as a hostile player where you’ll be shot on sight by Rust NPC’s and turrets for a while. We have some of the details for you below, along with a video going over all of the new updates, which you can read about here. If you break any of the above rules you will be marked as hostile and the scientists and their turrets will use lethal force against you. The hostile status persists across death in an attempt to prevent griefing.